Tragic news for the Steven Curtis Chapman family. Take a moment to pray for them in such an incredible time of grief. Updates are available on his website. One of my favorite SCC songs growing up was "My Redeemer is Faithful and True"
I am sure these words provide new meaning and renewed promise of hope in the God of the Universe. "The test of all happiness is gratitude; and I felt grateful, though I hardly knew to whom. Children are grateful when Santa Claus puts in their stockings gifts of toys or sweets. Could I not be grateful to Santa Claus when he put in my stockings the gift of two miraculous legs? We thank people for birthday presents of cigars and slippers. Can I thank no one for the birthday present of birth?" Check out this powerful story. As many of you know, due to the generosity of many people donating towards a great cause, my friend Jerry and I had our heads shaved bald last Sunday night after resonate. The money raised goes to Joni and Friends Philadelphia Region which runs a summer camp for those with disabilities and their families so they can enjoy a week relaxing and having fun - a rare treat for families who take constant care of a disabled family member around the clock. We happen to be in a series called Jesus: the Revolutionary where we're getting glimpses of Jesus as we study the book of Mark. This past week we were at the end of chapter 1 where Jesus heals a leper. Leprosy (which could also have been various types of skin diseases) was not only a disfiguring of one's skin, but also forced one to live in isolation, away from their community. Lepers were considered the untouchables. Those forced to the fringes of culture. In the teaching we pondered the question, Which is worse: a physical skin ailment or the relational and emotional separation from friends, family members and those in the community that you love? We also pondered, Who are the outcasts in our society today? Who is pushed to the margins? And how do we, in the name of Jesus, help to restore those people to the community they were intended to be a part of? In Mark 1, when Jesus heals the leper he not only heals him physically, but he also restores him into the community that he was originally intended to be a part of. After the leper is healed Jesus tells him to go to the priest and make the sacrifices Moses commanded. Jesus is referring to Leviticus 13 and 14 where God gives specific requirements for a leper who is cured of his skin disease to be restored back to the community. God, in and around the tabernacle, cared deeply about purity. When you deal with God's holiness you do it on His terms, not yours. -bringing two pigeons to the priest where he would kill one of the birds and sprinkle his blood seven times over a clay pot of water and then letting the other bird live. 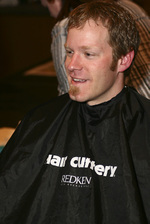 -and finally, shaving off all your hair. Seeing that the timing couldn't be better, I called Jerry up in the middle of my teaching and shaved his head to illustrate what a leper would have to do in order to be reinstated into the community. Here's a picture of me using Jerry has an object lesson during my teaching. One person commented to me afterwards, "I've never seen something like this before. I didn't know you were allowed to shave someone's head in church!" My friend Jerry has had cerebral palsy since birth and is mobile with the help of his high-tech electric wheelchair. (You can't see it in the picture, but his fancy chair is hiding under that sheet). Jerry was a good sport about it. But I said, "Jerry: I love you, brother, but with your condition there is no way that I would ever allow you to have a set of clippers in your hands and try to shave my head. I might end up in the ER with gashes in my head looking like I got into a Perkasie gang fight or something..."
Ironically, Jerry and I talked several months ago about the disabled community. In fact, if you put everyone in the world who had a disability into one country, it would be the world's third largest country! Jerry shared with me how he loves Jesus' interactions with lepers in the gospels. The way that Jesus loves those who are pushed to the fringes, he loves those nobody else will love, he touches the untouchables. Jerry mentioned that he believed that in our culture today some of the 'untouchables' - those pushed to the margins of society - are the disabled. What a beautiful picture it was for me to shave Jerry's head during the teaching as he is seen by many in our culture today as a "modern-day leper." Isn't that the gospel message? We all have - not a skin disease - but a sin disease and have been separated from God's holiness. Our priest comes to meet us outside the camp and heals us so that we can be restored to relationship with God and with others. And if we claim to be followers of Jesus we will follow his example: touching the untouchable, loving the unlovable, caring for the uncared for and reaching the unreachable with the good news of God's desire to restore people to their original relationship with God and others. After the service we encouraged people - for those who wanted to - to stick around. I invited Cassie, the young woman who cuts my hair, to come to resonate with her boyfriend. I offered to pay her to bring her clippers and come clean up Jerry's head (since I made such a mess of it during the teaching) and then shave mine. She was more than willing to help. 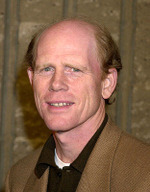 Everyone was telling me that I looked like a mix between Ron Howard and Terry Bradshaw. Okay, so I look goofy. So what? 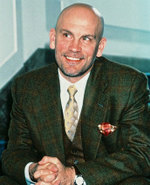 A few people said I looked like John Malkovich. I don't know...I'm not seeing it. The best "compliment" I received from someone was, "Well, you don't look...terrible." Here's a picture with Alex, a German twentysomething who is living in the US for a year and a half to learn English. I encouraged him to shave his head with me. He shook his head and in his thick German accent said, "Noh Danks..."
More pictures are being sent to me. When the pictures of Jerry, Cassie and myself are sent to me I will post them. I have to tell you: I have been freezing cold the past week. But hey, its for a great cause. And my hair will grow back quickly. 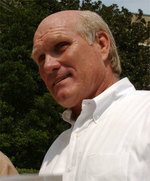 UPDATE: Doug Burns and Lauren Paupillo took pictures of the big event. 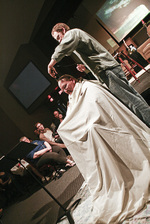 Check out Doug's website for baptism pictures and head shaving shots.